It all got easier when HTML5 was introduced, for developers and users alike. With HTML5 came the introduction of APIs that had access to device hardware, some of the introduced APIs in HTML5 is the MediaDevices. This API provides access to media input devices like audio, video etc. This object contains the getUserMedia method we’ll be working with. The getUserMedia API makes use of the media input devices to product a MediaStream, this MediaStream contains the requested media types whether audio or video. Using the stream returned from the API, video feeds can be displayed on the browser which is useful realtime communication on the browser. When used alongside the MediaStreamRecorder API, we can record and store media data captured on the browser. This API only works on secure origins like the rest of the newly introduces APIs, it works nonetheless on localhost and on file urls. First we check if the `mediaDevices` API exists within the `navigator` and then checking if the `getUserMedia` API is available within the `mediaDevices`. If this returns `true`, we can get started. The next step after confirming support on the browser for `getUserMedia` is to request for permission to make use of the media input devices on the user agent. Typically, after a user grants permission, a `Promise` is returned which resolves to a media stream, this Promise isn’t returned when the permission is denied by the user, which blocks access to these devices. 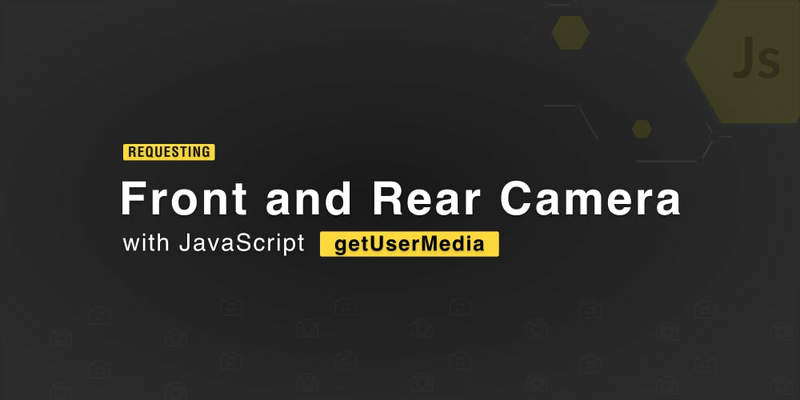 The object provided as an argument for the `getUserMedia` method is called `constraints`, this determines which of the media input devices we are requesting permissions for, if the object contained `audio: true`, the user will be asked to grant access to the audio input device. The constrains object is a MediaStreamConstraints object that specifies the types of media to request and the requirements of each media type. Using the `constraints` object, we can specify requirements for the requested stream like the resolution of the stream anto use (`front`, `back`). This will ensure that the stream resolution will returned will be at least `1280 x 720`. If this minimum requirement can’t be met, the promise will be rejected with an `OverconstrainedError`. With these settings, the browser will ensure that the return stream doesn’t go below `1280 x 720` and doesn’t exceed `1920 x 1080`. Other terms that can be used includes `exact` and `ideal`. That `ideal` setting is typically used alongside the `min` and `max` properties to find the best possible setting that is closest to the ideal values provided. This setting will make use of the front facing camera at all times in all devices, to make use of the back camera on mobile devices, we can alter the `facingMode` property to `environment`. This method when called, returns all the available input media devices available on the user’s PC. With the method, you can provide the user options on which input media device to use for streaming audio or video content. This method returns a Promise resolved to a MediaDeviceInfo array containing information about each device. **Note:** A label won’t be returned unless an available stream is available, or the user has granted device access permissions. We’ve gone through the process of requesting and getting access to the media devices, configured constraints to include required resolutions and also selected the camera we need to record video. After going through all these steps, we’ll at least want to see if the stream is delivering based on the configured settings. To ensure this, we’ll make use of the `video` element to display the video stream on the browser. Like we said earlier in the article, the `getUserMedia` method returns Promise which can be resolved to a stream. The returned stream can be converted to an object URL using the createObjectURL method, this URL will be set as video source. We’ll create a short demo where we let the user choose from their available list of video devices. using the enumerateDevices method. This is a `navigator.mediaDevices` method, it lists the available media devices like microphones, cameras etc. It returns a Promise resolvable to an array of objects detailing the available media devices. In the snippet above, we’ve setup the elements we’ll need and a couple of controls for the video. Also included, is a button for taking screenshots of the current video feed. Now let’s style up these components a bit. Create a `style.css` file and the following styles into it, if you noticed, Bootstrap was included to reduce the amount of CSS we need to write to get the components going. `feather.replace()`: this method call instantiates [feather](https://feathericons.com/\), a great icon-set for web development. The `constraints` variable holds the initial configuration for the stream. This will be extended to include the media device the user chooses. `getCameraSelection`: this function calls the `enumerateDevices` method, then, we filter through the array from the resolved Promise and select video input devices. From the filtered results, we create options for the `select` element. Calling the `getUserMedia` method happens within the `onclick` listener of the `play` button. Here we check if this method is supported by the user’s browser before starting the stream. Next, we call the `startStream` function that takes a `constraints` argument. It calls the `getUserMedia` method with the provided `constraints` . `handleStream` is called using the stream from the resolved promise, this method sets the returned stream to the video element’s `srcObject`. Next, we’ll add click listeners to the button controls on the page to `pause`, `stop` and takes `screenshots`. Also, we’ll add a listener to the `select` element to update the stream constraints with the selected video device. Now, when you open the `index.html` file on the browser, clicking the `play` button should start the stream. This article has introduced the `getUserMedia` API, an interesting addition to the web that eases the process of capturing media on the web. The API takes a parameter ( `constraints` ) that can be used to configure the get access to audio and video input devices, it can also be used to specify the video resolution required for your application. You can extend the demo further to give the user an option to save the screenshots taken, as well as recording and storing video and audio data with the help of MediaStreamRecorder API. Happy hacking.